how can i play you mofapes when im running linux? in KEGA, netplay still seems to work but i havent been able to try it. do you think i would be able to connect with windows users or only linux users or none at all? 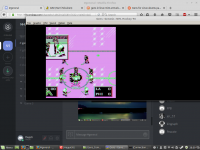 I am a Linux user (use Windows rarely) and tested playing with ZSNES online with a guy using Windows 8 (or 7) and it worked well. It doesnt play any role what OS you are using. We did not use Hamachi that is mandatory here it seems for both SNES and GENS online playing. That is a huge problem because with Linux it is a pain in the a.. to get conneceted. that I had when trying to use Hamachi or various Hamachi clients for Linux. I read many forums and this probably has no solution. Even the tech gurus have problems with this. The only solution for Linux users is to not use Hamachi and connect directly to your opponent. Which is better than using Hamachi, the less middlemans the better. But some people do not want to struggle with port forwarding or just do not know how to do that and have to use Hamachi so you have to use it as well. 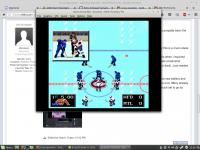 You can always run Windows a virtual machine, or just dual boot into windows for nhl94. Linux is free, but with free comes more limits. I was under the assumption that it's almost impossible to get hamachi work under Linux. This has propably been the case at some point, but it seems to work completely fine now. #3 Use Wine to run EmuCR_Gens-rr_r352.tar.gz. That is a Gens version provided by Smozoma when I inquiried regarding some problems on general gens-netplaysave.exe and it looked like pink mushrooms, see screenshot below. Gens rerecording works perfectly for me at least. #4 I added the new kaillera to the tar.gz file above. There is the latest server supporting kaillera file as well, you just need to rename the kailleraclient.dll-server to kailleraclient.dll and obviously rename the current one for example to kailleraclient.dll-new before that if you want to play on a server. It has the recorder plugin as well so you can record games in new kaillera. Adjusted some settings for smoothness on my poor laptop and played against JV via Hamachi and new kaillera and works completely fine in Linux. I'm still saving XP for dual boot just in case, but this eases stuff out a lot. Wboy already provided the help to run Nose in Linux as well the other day so looks like Linux users are pretty much set to go as well. Worked yesterday, but today I'm getting a black screen on game connect online. It's a familiar problem from Windows at some times, but can't recall the fix. Maybe there is something other that needs to be done still as well. That's really awesome to hear! That's sick. By the way just port forward, Hamachi is just a way around doing that but isn't necessarily at all for p2p. Everybody playing this game in leagues should have port forwarding done. Donny how is the frame rate and response while using wine? I've tried using parallel on Osx running Windows with gens but the controls are just not as responsive. Port forwarding would be ideal, but there are always some that can't do it for some reason, so hamachi is a must, but one can dream. I've got an old laptop I'm using. HP Elitebook 6930p, which is c2d 2,4ghz 4gb ram. It came with Vista and I've been through all 3 Windows version from XP, Vista to 7 with it. I just needed Windows for some games and after running to a weird problem with 7 I decided to stick to XP for Gens & NHL94 purely. After playing with Wine with netplaysave or rerecording there is no difference in responsiviness to keyboard at least to any Windows OS and I did play 3 online games yesterday vs JV. FPS is stable and high, but with JV we always have a jumpy connection so there are occasional drops, but it's been completely fine. Now I just have to solve the black screen issue on online gens, it should not be a big issue as it's been proven to work already. I'm running Linux mint 18, which I installed just a couple of days ago. 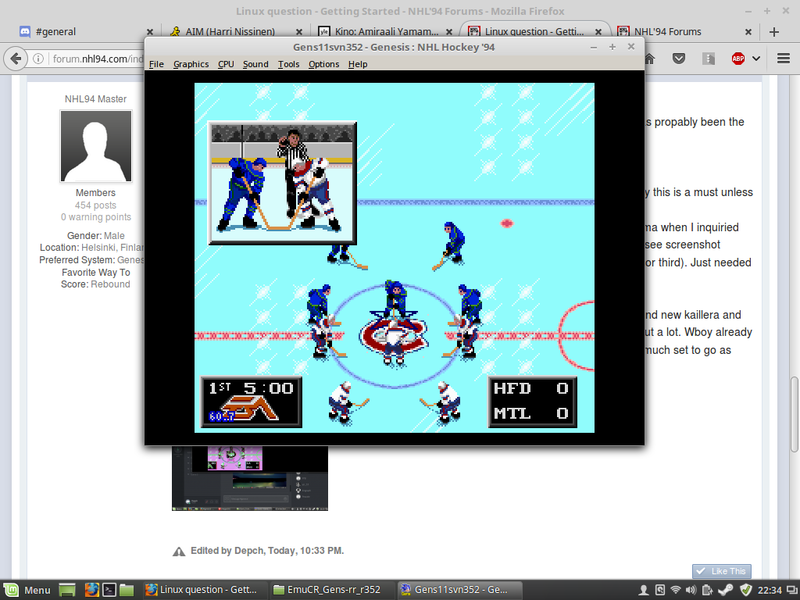 And the black screen issue seems to be linked to the rom itself as nhl94playoffs.bin works online now. This has propably got something to do with the .srm files and me testing it out on multiple emulators. Plus more on the FPS now that I'm looking at it more closely. FPS with rerecording default settings seems to be around 50is, so it's not maxed out on 60. But have to remember that this is an old unit of like 8 years old, even though higher end at that time. A newer unit even by 3-4 years might do better and desktops most likely. I usually run Gens without sound and when I have sound off the FPS is stable 60 with Wine too, so this is like running Gens under Windows for me as is the control responsiviness.